8vo. HB with DJ, William Heinemann, London, 1984 First edition of the Nobel prize winning chemist's seminal work, in which he renders the main threads of his research accessible and applicable to the world at large. 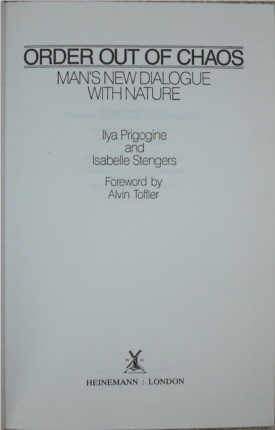 By first analysing the Classical and Newtonian modes of understanding nature, then how they were unable to properly incorporate advancements in thermodynamics, Prigogine begins to outline a new way of interpreting the world, with a view to equilibrium, reversibility and transformations. 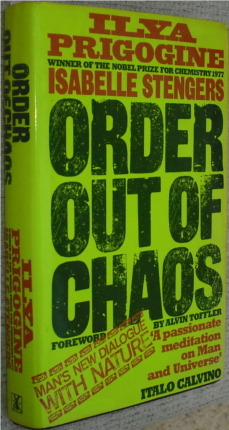 Contains a multitude of b/w diagrams, copious notes and an introduction by futurist Alvin Toffler on science and change. Fine condition . Minimal shelf bumping to the extremities of the dust jacket and the merest whisper, if that, of foxing to page edge, otherwise it is as new. This copy was ordered via the library at STL labs of Harlow (in the news recently after Charles Kao was awarded the 2009 Nobel prize for physics) and even has its purchase order.